Led by Pandora's Collective members, a pre-selected book will be discussed each month. Sep 12: This is Your Brain on Music by Daniel Levitin; Oct 10: The Curious Incident of the Dog in the Night-time by Mark Haddon; Nov 14: Annabelle by Kathleen Winter; Dec 12: Prisoner of Tehran by Marina Nemat. Terry Fallis discusses The High Road. ; Marina Nemat discusses After Tehran. ; Dan Gardner discusses Future Babble: Why Expert Predictions Are Next to Worthless, and You Can Do Better. ; Philip Slayton discusses Mighty Judgment. 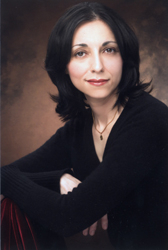 Marina Nemat discusses After Tehran. Marina Nemat is currently considered a "single author." If one or more works are by a distinct, homonymous authors, go ahead and split the author. Marina Nemat is composed of 2 names. You can examine and separate out names.